Early on in our journey, this quote became our motto. I can’t take any credit. It was originally coined by Gene, in response to a quandry brought on by an accident in the headwaters. After repairs were made, we faced a choice between foregoing some river miles or missing one of our planned service stops. Our new motto became a litmus test whenever we considered a change of route or a modification of our itinerary. We thought of it when people emailed us to ask if we could stop and have lunch with them, or invited us to stay in their home to talk with their children about service to others. We considered it when people asked us to stay overnight to meet their friends, or paddle a few miles out of our way to meet the spouse of a volunteer we met during a day of service. You see, each morning we asked God to put people in front of us that God wanted us to meet. We learned when you ask something like that, you’d better be ready for an answer! The greatest joy of the trip, even better than the amazing river, the spectacular wildlife, and the peacefulness of daily life lived in the outdoors was meeting interesting, kind and generous people all along the way. Since we’ve been home, we’ve kept up with some of these friends through emails and social media. Jason and Jeni, who since helping us overcome a river crisis, have gotten married, bought a home, and had a beautiful baby girl. Jennifer, who started After School Adventures in the neighborhood by her church, left that flourishing program in church hands and with her family, relocated to Texas to serve with Pioneer Bible Translators. And Elizabeth, who recognized a need, began a GED tutoring program in her town, and, with dedicated volunteers, is still changing lives. 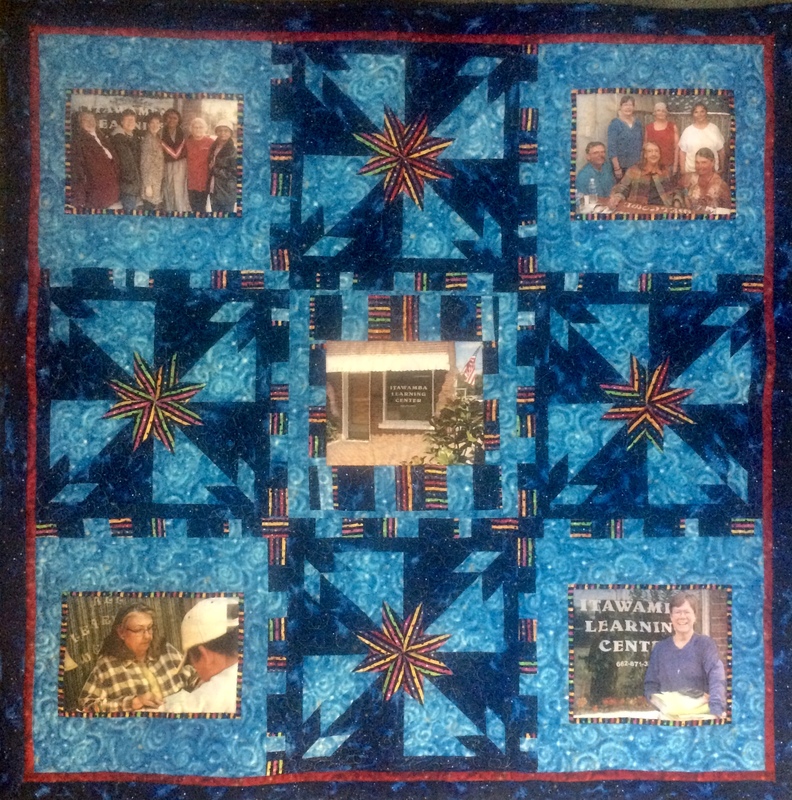 Elizabeth recently sent us this beautiful quilt, handmade by Judy, one of the Itawamba Learning Center volunteer tutors. Among other pictures, it has a photo of a student we met, who went on to attend the area college. 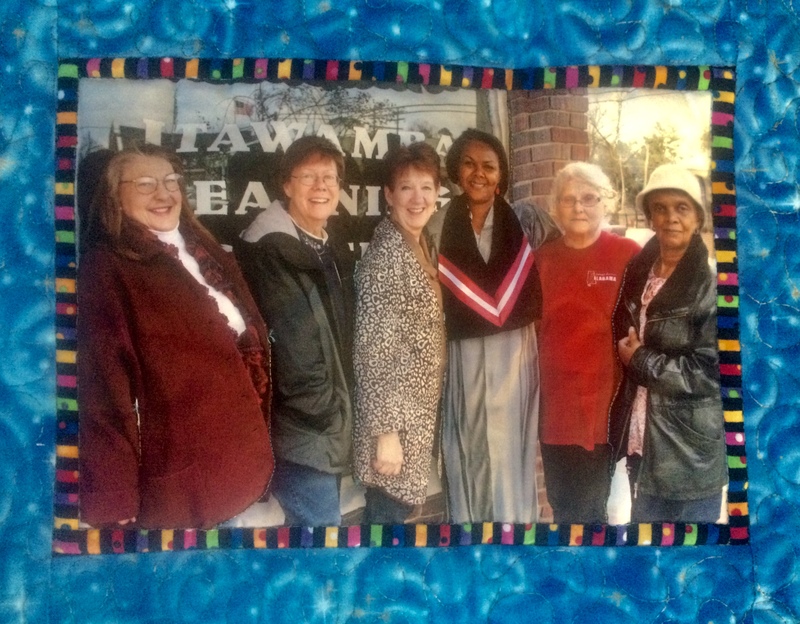 The photo shows her with the Itawamba staff on her graduation day, her mother on the far right. This summer and fall, we look forward to several book tours along the Mississippi and Tenn-Tom waterways that will give us a chance to visit and catch up with the amazing folks we met on our trip. We plan to be in the St. Louis, Hannibal and Dubuque areas in June; Brainerd, Bemidji and Little Falls areas in July; Paducah, Fulton, Savannah and Demopolis areas in August; and the La Crosse, Ferryville and Twin Cities areas in September. (If you are from these locations and know of libraries, bookstores, or churches that might be interested in meeting us, we’d love to know.) As we arrange programs, readings, and/or book signings, we’ll list them on our website. Look for the “Appearances” tab on the main page.